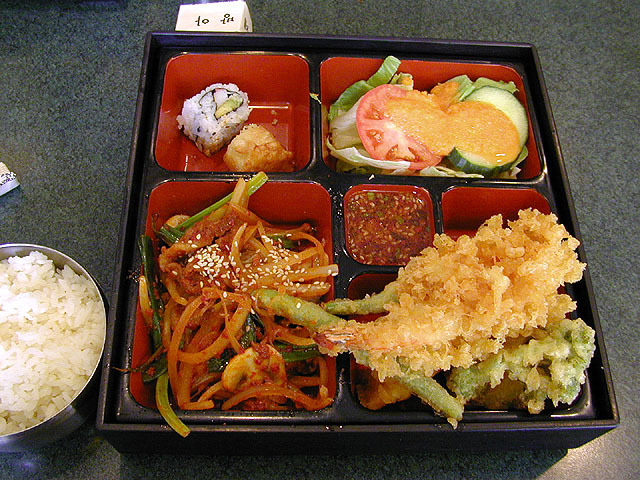 i met klea for lunch today, korean box lunch special in chinatown. julie had wanted to come too, but at the last minute she couldn't. klea and i had planned this lunch two weeks ago, but i got stuck on my project and couldn't do it until now. i waited for klea at our old shuttle bus stop by south station behind the federal reserve building, just like old times. the turtle graffiti on the stone grass borders was still there. after a little bit of waiting, klea finally arrived and we walked to chinatown. 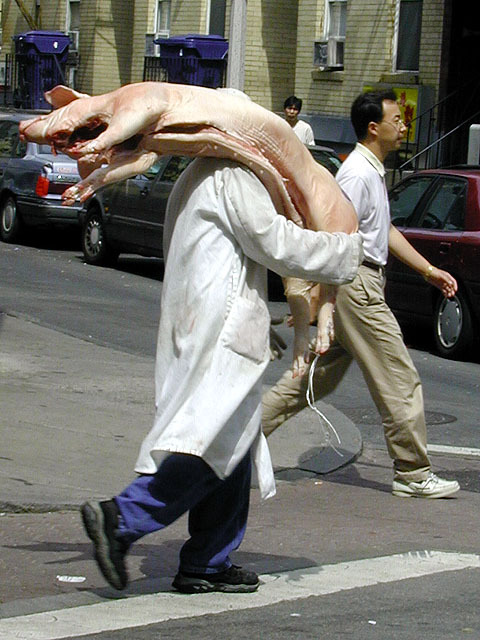 we were greeted by a truck delivering freshly killed pig carcasses to a chinatown butcher shop. we went to the restaurant that had the box lunch specials, the korean place on the corner with the yellow awning, the restaurant that i still to this day don't know what the name of it is. i'll find out next time. i had the spicy pork bulgoki, klea had the beef variant. afterwards we went shopping at the meitung supermarket. i got some dried prunes, a few packets of fishnacks [sic], a box of chocolate collon, grape gummies, and some dried orange peels. we said our good byes at south station and i went back to work. at work i'm starting to amass a small stash of food. this has attracted all sorts of interesting office denizens who come by my work area foraging for sustenance. 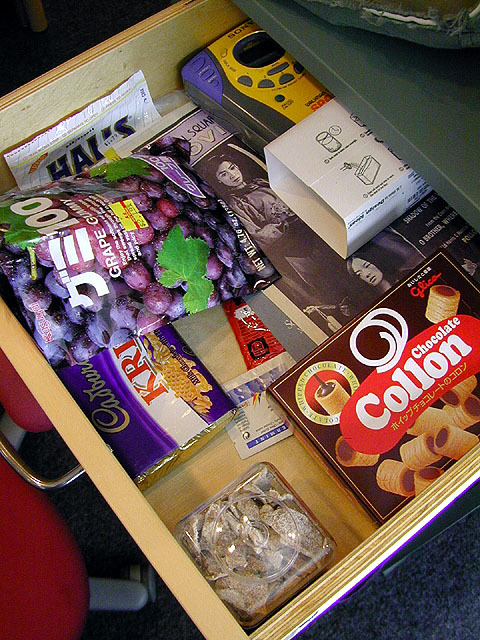 there's actually a lot of food in the office, if you know where to look and who to ask. there's always food in the fridge, but one never knows who it might belong to. i also downloaded a bunch of arabic belly dancing music. it's really great, puts me into this exotic middle eastern mood while i'm programming. i'll be sure to bring some with me when i go to turkey. after work i went to the gym (visit no.5! ), where i met john for our nautilus strength training. i was in some serious pain all day, and i wasn't so sure i'd be able to do anything on the nautilus, but once i got over the initial pain, my body loosened up and i was able to work the machines with little to no pain. we started immediately with the lat pulldown machine, the most popular machine in the gym, our lucky day that nobody was using it at the moment. after 30 minutes on various other machines (i'm pretty sure i'll be feeling some pain in entirely new parts of my body), we left the gym. i went back to the office, where laurie was still working diligently. i gathered up my stuff and rode the motorcycle home.